LPB has been shown to produce designed compression as deep as 12mm in nuclear waste containers, exceeding the depth required for the surface to resist stress corrosion cracking for the 50,000 year design life. Lambda Technologies has developed a solution to significantly strengthen the closure welds of nuclear waste containers. 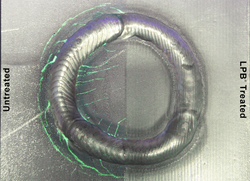 Using low plasticity burnishing (LPB®), Lambda engineers designed a deep, stable layer of residual compression for the closure weld. LPB replaces tension from weld shrinkage with deep residual compression. Stress corrosion cracking is eliminated, and even existing shallow cracks cannot propagate, eliminating the risk of failure. Nuclear power is a practical source of energy capable of meeting the world’s power requirements. However, stress corrosion cracking of welds has plagued existing reactors and waste containers, impacting both safety and cost. In 2006, LPB was selected over all other methods to eliminate residual tension in the final closure welds of long-term nuclear waste storage containers for the Yucca Mountain Project. A dual LPB system was integrated with the robotic container positioning and welding system designed by Idaho National Labs (INL). During initial trials, INL staff reported that the system integration and initial trials were flawless. The initial trial demonstrated reliability, efficiency and ensured performance with continuous 100% processing documentation. In the years since, the LPB process has only become more efficient and reliable. LPB has been shown to produce designed compression as deep as 12mm in nuclear waste containers, exceeding the depth required for the surface to resist stress corrosion cracking for the 50,000 year design life. “It is encouraging to see that a number of companies in many industries are including the use of designed compression through LPB on initial designs as well as treating existing components in the field. With designed compression, we can be certain that these containers will last and ensure safe, clean and efficient storage of hazardous waste materials,” says Dr. Jayaraman, Director of Materials Research at Lambda Technologies.